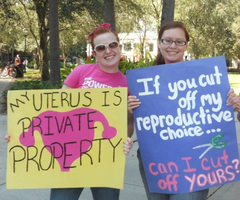 Pro choice signs. . Wallpaper and background images in the Feminism club tagged: feminist feminism. Wait, let me get this straight: No one can come on to you, but if you are told that you cannot go after someone, you will remove their reproductive organs? Nicole Kidman - "I was raised দ্বারা a feminist mother."